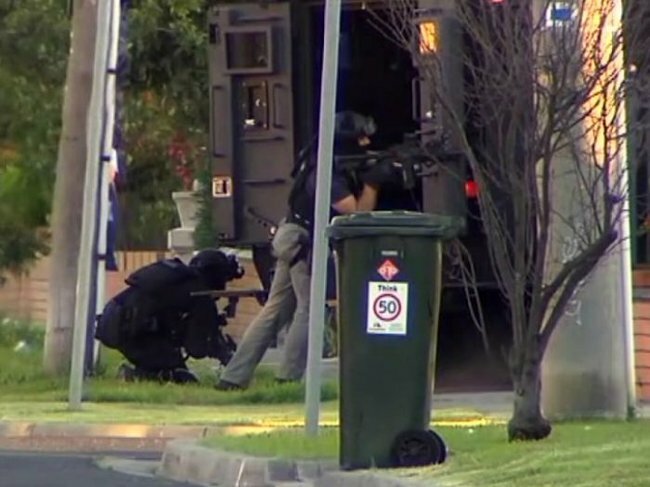 Man charged with attempted murder following St Albans standoff. Man charged with attempted murder following St Albans standoff, trafficking charges laid after Melbourne raids. A man has been charged with attempted murder, and four others have been charged with drug offences, following police raids in Melbourne over an alleged international drug trafficking syndicate. Seven people were arrested in Melbourne and Sydney on Monday after warrants were executed at a number of properties. During one raid in St Albans, police were involved in a standoff for five hours after shots were allegedly fired at officers. A man later handed himself into police. A 27-year-old woman from Maribyrnong, a 28-year-old Italian national, a 26-year-old Melbourne man, a 55-year-old Cairnlea man and a 33-year-old St Albans man were all charged with trafficking a large quantity of commercial drugs. The St Albans man was also charged with three counts of attempted murder. Police said they would also apply for a 36-year-old from Sydney to be extradited to Victoria.